Titus has history, why not be part of it? Growing from a frame shop that took raw tubes and turned them into titanium frames, in Phoenix, Arizona in 1991, Titus has grown into one of the premier suspension frame builders of it’s time. From day one, Titus was always pushing the material envelope; developing frames using high strength steel, titanium, aluminum and carbon fibre. Despite this material genius, Titus suffered some financial difficulties and was forced into receivership in late 2010. Planet X, parent company of Planet X Bikes and On-One, purchased the brand, designs and tools out of bankruptcy, and with the help of faithful supporters, refocused it with a direct business model and cutting of overheads, along with new product development to keep Titus afloat. - Alloy Rockstar. Built in Portland, Oregon, USA and features 100mm of XC race or trail duty on a 29er platform. The alloy front triangle features an oversized, tapered head tube, a custom CNC machined bottom bracket, mated to a full carbon rear triangle with a carbon rocker driving a Rock Shox Monarch RT3 shock. - Rockstar Carbon. Hand laid up with High Modulus T700 and T800 Toray carbon fibre, the Rockstar Carbon was developed and tested over the last 18 months to ensure that this was the ultimate 29er rocket ship. 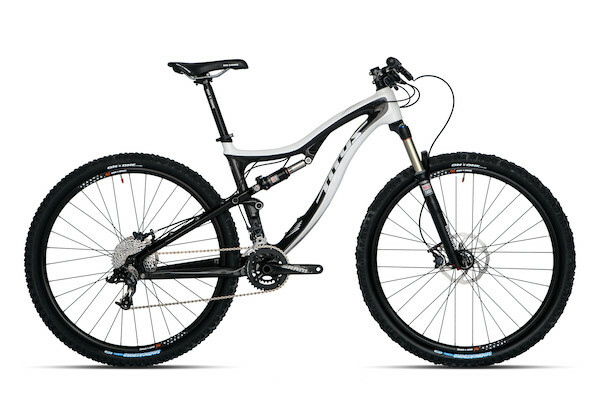 With full carbon construction, the Rockstar carbon is right on 6lbs (including the Rockshox Monarch RT3 rear shock). We’re offering you two new bikes built on these frames, to help you experience that historic ride that’s has people eagerly awaiting these models for many months. Here's a glimspe of the top-end Carbon model- from just £1799.99 with SRAM X5.